With lots on common names including Baby Panda Grass, Pogonatherum paniceum is known as Malay Pygmy Bamboo, and Baby Panda Bamboo. This is a this low growing bamboo like plant will reach between .5m am 1m in height depending on cultivar. An excellent low growing plant for a Japanese, Chinese or Balinese style garden. A natural clump forming nature and a very dense growth habit make this a very useful, low growing landscaping plant. Use it as an understory plant in a tropical look garden, or grow it in containers. Although it looks like bamboo it is actually a grass, with a strong clumping habit. It does require constant moisture, however if planted in pond margins, or simply given drip irrigation it will thrive. Could be used as a potted specimen or is the border in clumps. 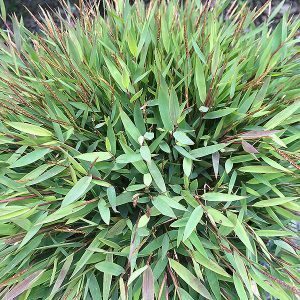 Also called Dwarf Panda Grass and sold as , Pogonatherum paniceum c.v. Monica, whatever the name its not really a bamboo, it looks like a miniature or dwarf bamboo, its not, but it is an interesting grass. Originally from south-east Asia Pogonatherum is a rainforest plant and as such requires constant moisture. Pogonatherum paniceum is a clumping plant and can look good as the edging plant for a water feature, or plant it in a pot. Try using the wet pot watering system to keep it moist. Grows equally well in containers as in the ground. Pruning at the beginning is spring, just as new growth commences will keep the foliage, neat, new and attractive.